Hey there everyone! First of all, let me start by saying I’m soooo sorry for my absence! I haven’t posted in about two full months! I’ve been really, super busy and procrastination keeps getting the best of me when I’m not. I can’t believe tomorrow will mark one year of Life of a Recessionista and I have it abandoned. But nonetheless I’m back! And hopefully good things will be up on here soon. I plan on doing a give away to celebrate my blogaversary and as soon as I figure out what I’d like to give away I’ll post it and promote it so you can enter, so stay tuned! Did you ever see the movie “Clueless” with Alicia Silverstone and Brittany Murphy? Remember the scene where Alicia wakes up and starts getting ready to go to school and when she’s deciding what to wear she browses through all of her outfits on her computer and then pulls it out of her closet? I have forever been jealous of her. But not anymore! I recently downloaded this app on my phone and I am obsessed with it. It allows you to keep a full inventory of your wardrobe right on your phone and create outfits just like Alicia did in Clueless. It’s called Stylish Girl and best of all it’s free! And available on both Android and iPhone. I have the iPhone version so this review will be based on the iPhone version of the app. It is basically pretty simple to use. The photos below are the actual screenshots taken from my phone. How it works? 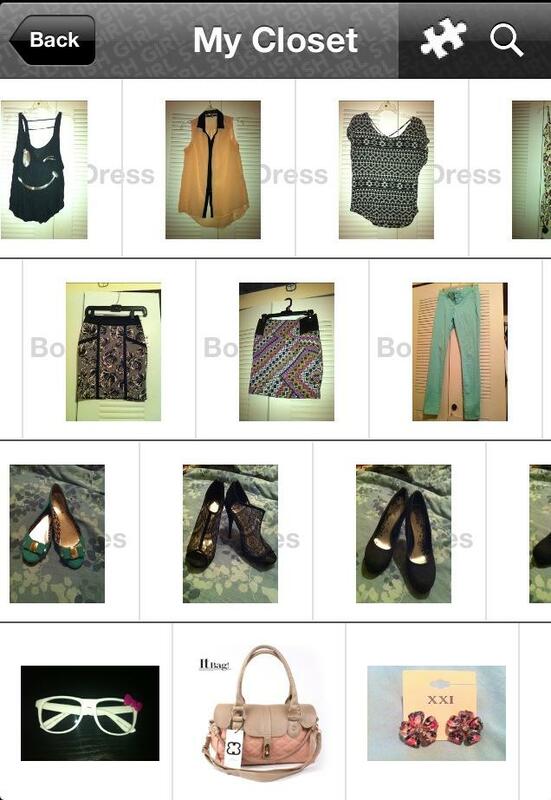 You take pictures of each individual item in your wardrobe, upload it to the app, categorize it (top, bottom, shoes, accessory, etc) and voila! Your own personal wardrobe inventory and outfit creator at your fingertips. If you’re like me and don’t like a clutter of photos in your phone, you can delete the photos from your camera roll and the photos will remain uploaded in the app without using unnecessary photo storage on your phone. The app also has a couple of other cool features. It allows you to mark the dates when you last wore an item. It also has a feature where you can plan the outfits for your next trip by adding them to your ‘Suitcase’. And there’s a feature called the ‘Fashion Lounge’ where you can get inspiration from outfits and pairings made by other people (sort of like Polyvore) but I haven’t really messed around with this feature yet. I recently discovered Polyvore. It is a fashion blogger’s best friend. It allows you to make fashion sets and puts at your fingertips all items your little heart can imagine. I went crazy. I spent hours (easily) making the set above, and enjoyed every minute. The feature I loved the most is that you can sort the items you’re interested in for your set based on price. Every item featured above is $50 or less. Since this is my first set, it isn’t half as elaborate as some of the sets on the site. I just wanted to showcase how I would mix and match some of my fall obsessions from my previous blog post, mainly a brown leather jacket (in the middle) and pair it with the two different floral print outfits (each to the right and left). I also added a little leopard print in there cause who doesn’t love a little leopard. 😉 Price list and links for all items listed below.